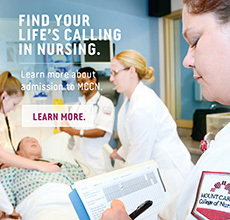 Transcripts - All college transcripts, both undergraduate and graduate, must be mailed directly to Mount Carmel College of Nursing, Master of Science Program. One page, 300-word typed statement of purpose written by the applicant that outlines the applicant’s goals and objectives for the pursuit of graduate study. Please include any appropriate information to explain any unusual circumstances such as: GPA or gap in employment. Two letters of recommendation from individuals such as work supervisor, professional colleagues, and former faculty members who hold a minimum of a Master’s degree.